The Royal Bermuda Yacht Club announced that invitations for the 2019 Argo Group Gold Cup were issued today [Nov 27] for the match racing regatta scheduled May 6-11, 2019, with a $100,000 prize purse in the offing. The Argo Group Gold Cup is sponsored by Argo Group, an international underwriter of specialty insurance and reinsurance. 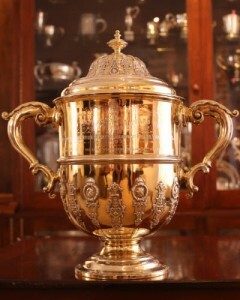 Invitations for the King Edward VII Gold Cup, one of the most coveted trophies in match racing, were sent to 12 skippers based on their world ranking and past participation. The fleet will again compete in International One-Design [IOD] sloops on Hamilton Harbour. Earlier this year Taylor Canfield of the U.S. won the King Edward VII Gold Cup a second time, having previously done so in 2012, and Lucy Macgregor of the U.K. placed fourth overall, the best finish ever by an all-women’s crew. The Argo Group Gold Cup is sponsored by the Argo Group, an international underwriter of specialty insurance and reinsurance products in areas of the property and casualty market.